Growing up with pre-existing conditions was no fun. Managing them now as an adult hasn't gotten any easier. Around our district and the country, Americans of all stripes and shades are bearing the burden of roller-coaster healthcare costs, the uncertainty of coverage and most importantly - STAYING HEALTHY. 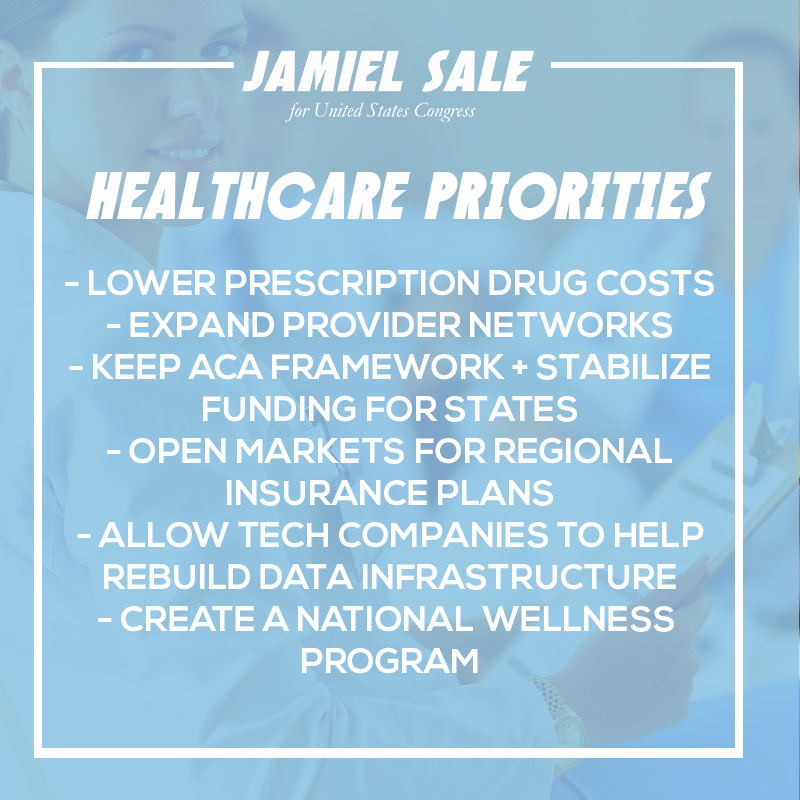 If elected to Congress, I'll fight to make sure that the Affordable Care Act is fixed and new market principles are enacted to secure and stabilize our healthcare system. In addition to that, I'll work to put a bill forward that provides the state with funding to build out their own wellness programs; I've always been taught that prevention is better than cure. Preventative medicine and wellness initiatives are the future of medicine. Alongside building out new initiatives, we've got to work on the technology aspect of our system. To ensure quality care, healthcare providers need to be able to communicate effectively to each other. I believe that a redeveloped, patient-driven database for hospitals to share patient information with each other makes sure that care is consistent. We know prescriptions are expensive; it's time to fix that. Lastly, expanding who can see and treat patients, allows for more choice for Americans. We know that doctors office visits or ER visits can be a task. Maybe a clinic ran by nurse practitioner or a physician's assistant can help you get seen and treated faster than ER would.